Norcroft are experienced roofers in Sunderland, we can undertake all types of roofing projects in Sunderland and the North East, from full roof replacement, roofing repairs, flat roofs, guttering and flashing. Contact us now for all your roofing needs in Sunderland, Newcastle, Durham, Teesside and Northumberland. The North East can get some extreme weather and over time this can take it’s toll on your roof, eventually it might need replacing. Replacing your roof is a big job and needs to be done promptly and professionally, that’s where Norcroft come in. If your roof is leaking from multiple locations it might mean you have serious damage to the integrity of your roof. It might be cheaper in the long run to replace your roof rather than continually patching up repairs. If you roof is sagging in places it probably means that the structure and strength of your roof is damaged. If you notice sagging on your roof you should get it looked at immediately. 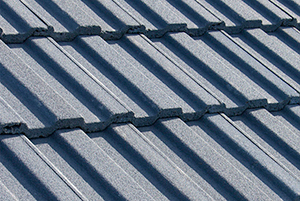 If you find that our tiles are slipping, falling into your gutter or falling to the ground on a regular basis it might mean that your roof and tiles are deteriorating and you need a new roof. Clay roof tiles can last up to 100 years which is obviously a bonus when choosing a material for your roof but they are generally the most expensive tile. Clay tiles tend not to discolour so will still look good in generations to come. 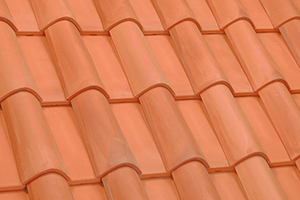 Clay tiles also have good fire proof qualities and are very durable. 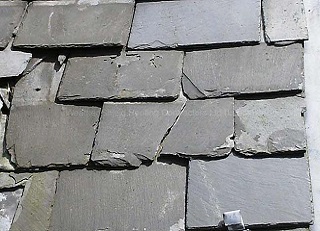 Slate tiles are probably the most common material you will find on roofs in the UK probably because of their long lasting quality. Slate is fireproof, waterproof and is in plentiful supply in the UK. Slate roofing requires a roof with a pitch of at least 30 degrees and is a heavy material so make sure the structure of your roof is strong enough. 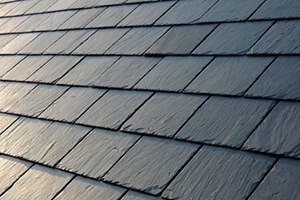 Generally less expensive than slate or clay concrete roof tiles have some advantages, for instance there is now a huge range of styles, they are durable, long lasting and are often treated with special coatings to help protect them from rain, rot and insects, they also have very good fire resistance properties. Bad weather can sometimes dislodge overlapping tiles causing leaks in your roof which if left can cause further damage to your property. If a large percentage of your tiles are cracked or your roof is dipping or sagging you may need a new roof. Since the 1930’s roof tiles were laid on a waterproof membrane which gave an extra layer of protection should your tiles slip or get damaged but on a lot of older roofs in Sunderland lime mortar would have been used to cover the underside of tiles or slates to keep them in place and to windproof them. This lime mortar over time will deteriorate and fall out into your loft space, this can result in your tiles becoming lose. If you need a new flat roof fitted in Sunderland we have vast experience in all different types of flat roofing. 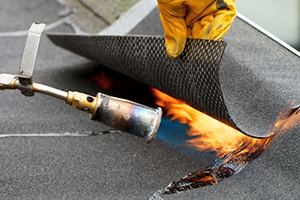 A torch on felt roof is your traditional bitumen based roofing solution, if applied correctly you can expect at least a ten 10 year lifespan before you might have to repair or replace it. Getting your flat roof inspected and maintained regularly will help to increase the longevity of the roof. A bitumen flat roof can get damaged quite easily if it is walked on to often or underneath trees where branches may fall off or if wet leaves are left to sit on it for long periods of time. It is the cheapest option and sufficient for most flat roofs. EPDM rubber roofing is a relatively new solution for flat roofing and is becoming increasingly popular due to the fact it can be laid as one whole piece (Depending on roof size) with no joins and is glued down to a hardboard decking which is screwed to the roof joists. 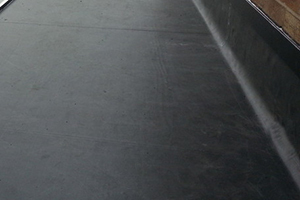 EPDM rubber roofs are flexible and strong and some are guaranteed fo 50+ years. So if you are looking for a long term flat roof in Sunderland then this might be the type of flat roof you want. GRP and fiberglass roofing is also a relatively modern flat roofing solution. Long lasting (up to 30 years) extendable and available in different colours it is becoming a popular choice for flat roofs in the North East. 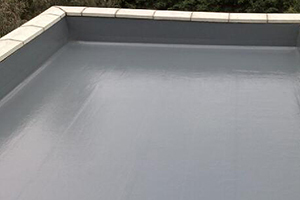 GRP Roofing is also very durable, extremely waterproof, can be walked on and repairs easily in case of any damage. A lot of the older properties in Sunderland will have a percentage of flat roof, especially on top of bay windows and extensions. Flat roofs are prone to leaking as rain water can sit on top of the roof for long periods of time and if the roof felt is damaged water can slowly seep thorough cracks causing damage to the ceilings below. If you would like to talk to Norcroft Construction about your roofing in Sunderland, Newcastle and the North East please contact us using our contact form or using the details below.